Got some clutter taking over your small spaces? Or maybe even a tiny home? 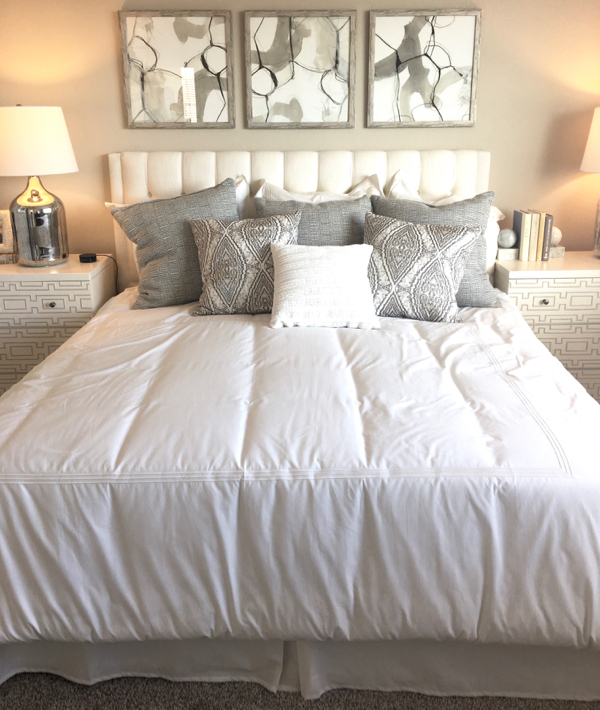 It’s time to really make your space count!! Make your small home work beautifully with these Creative Storage Solutions for small spaces, and easy hacks to make tiny homes feel bigger! 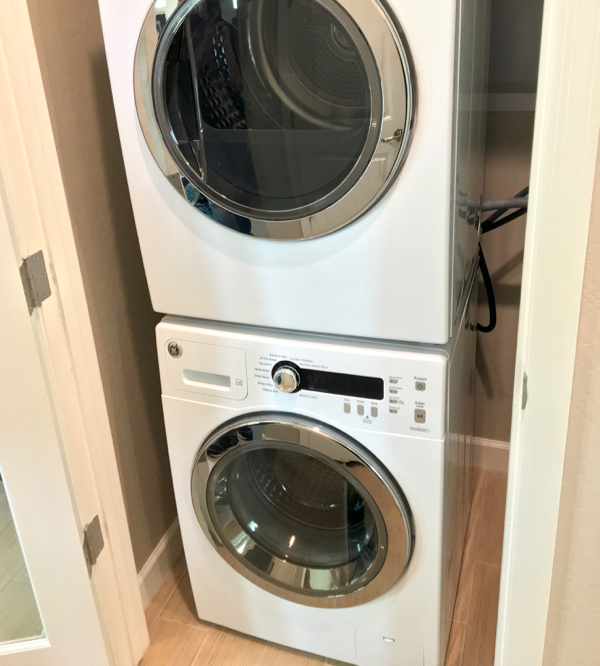 Finding new Home Organizing Tips and Tricks is always fun, and you won’t believe how much of a difference these organizing hacks will make! 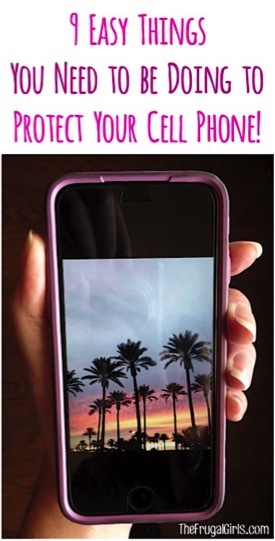 Are you ready to take control of that clutter? 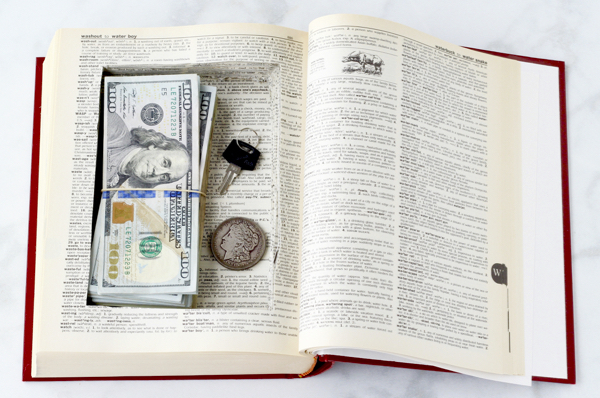 You’re going to LOVE these tried and true tips from your frugal friends! Let’s get started! 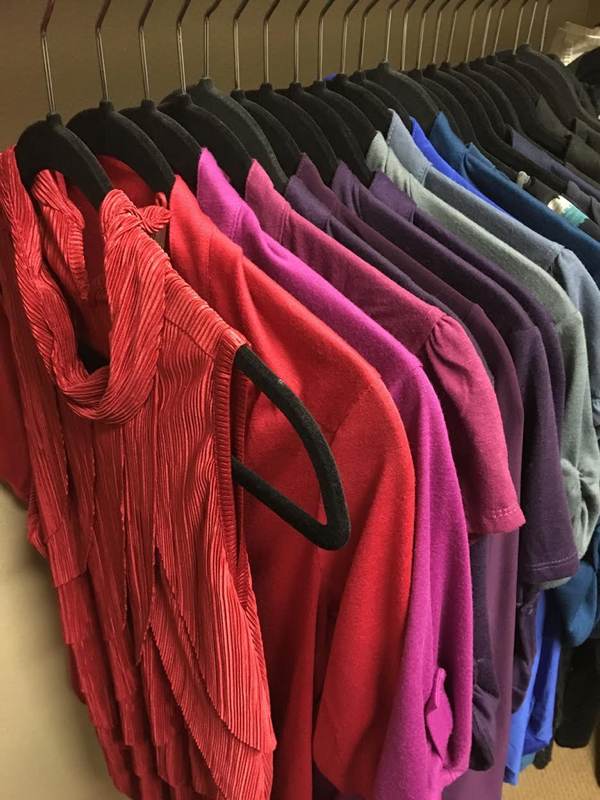 Check Out my Favorite Easy Closet Organization Tips! Storage Furniture Deals at Walmart! 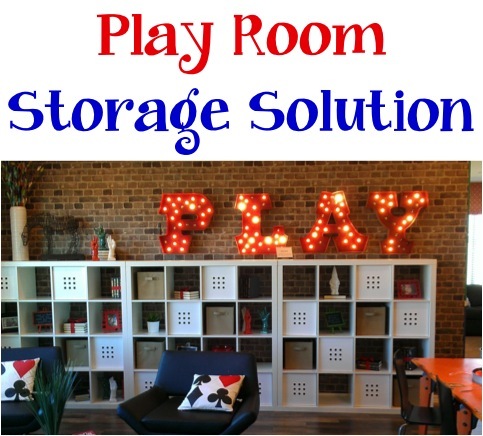 Need some new Storage Furniture? 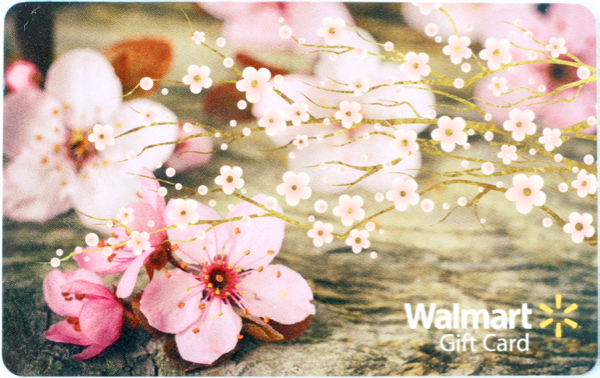 Get a deal when you use a Free Walmart Gift Card + check out these 14 Walmart Shopping Hacks to help you save BIG! How to Get Free Walmart Gift Cards + 12 Creative Shopping Hacks! Designated Donation Baskets: To ensure you’re not keeping things you no longer use, and reducing that clutter on an ongoing basis, designate a special basket as your Donation Basket! 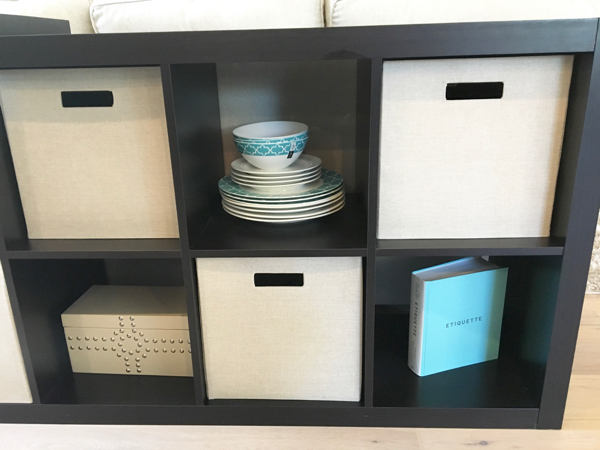 Having a pretty ‘donate box’ will allow you to keep it out in the open, and will greatly reduce that clutter! Storage Ottomans: Storage Ottomans make a great double-duty space saver in your living room or at the end of your bed! 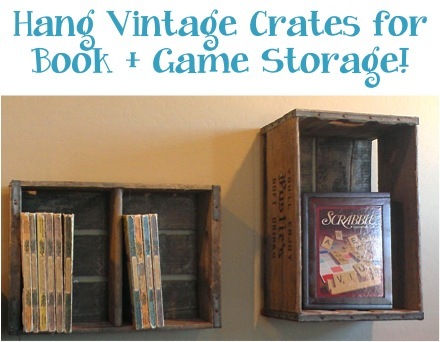 Use them to store board games, magazines, extra blankets, throw pillows, etc! Got small bedrooms? 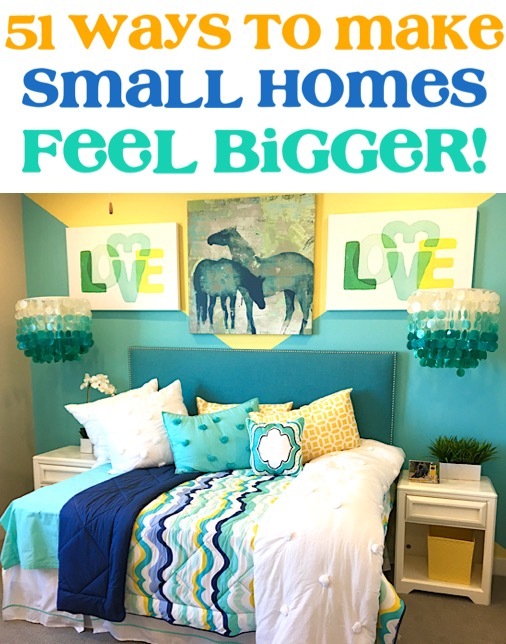 Here are some fun ways to make small bedrooms feel bigger! Mirrors and Mirrored Closet Doors! One of the EASIEST ways to make a space feel twice as big is to add mirrors. 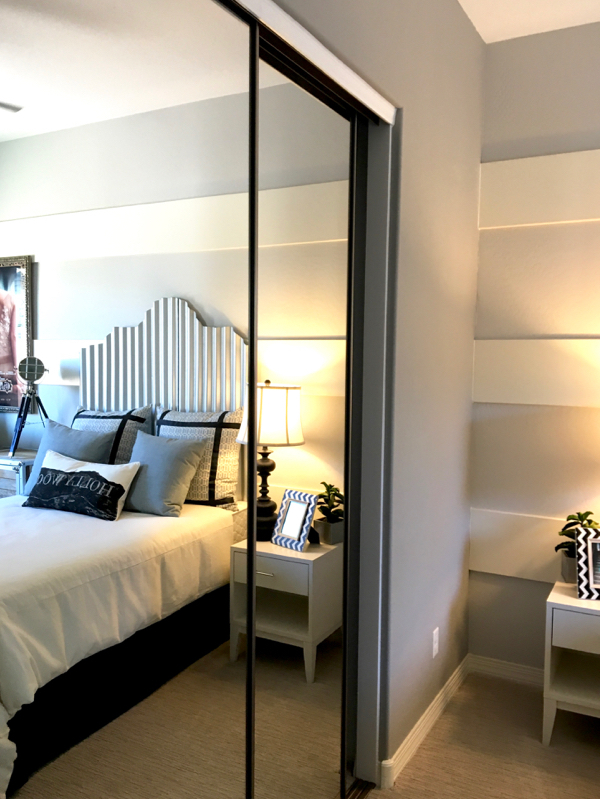 The light and reflections bouncing off mirrors instantly make a room feel so much larger! I like the combination of both mirrors and mirrored closet doors to add the illusion and feeling of a big space. They’re easy to keep clean with this frugal Homemade Glass Cleaner Recipe! Deals on Closet Doors at Home Depot! Need New Closet Doors? Score a sweet deal! 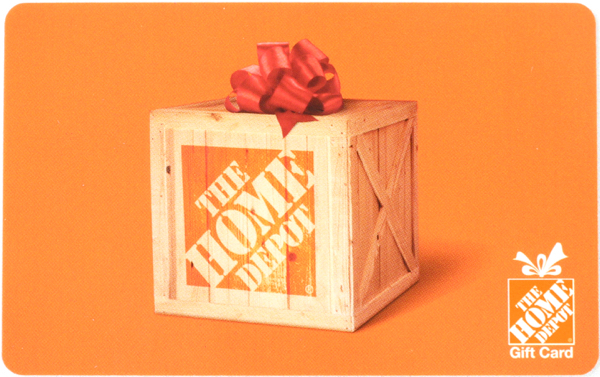 Learn How to Get a Free Home Depot Gift Card + 20 Home Depot Shopping Hacks to Save You More Money! 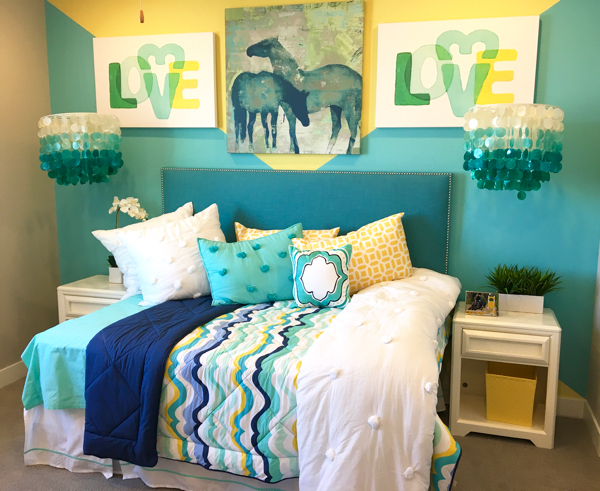 Suspended Beds: Suspend beds from wall to add loads of space to a child’s bedroom! Daybeds: Daybeds are such an efficient use of space, and will make your small room feel so much larger! I personally love using daybeds to increase the space in tiny bedrooms. 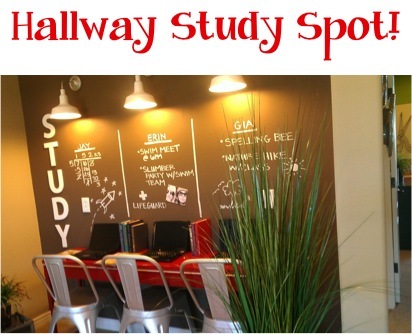 Or another option is to turn your office into a study / guest room…. office on one side, daybed on the other! 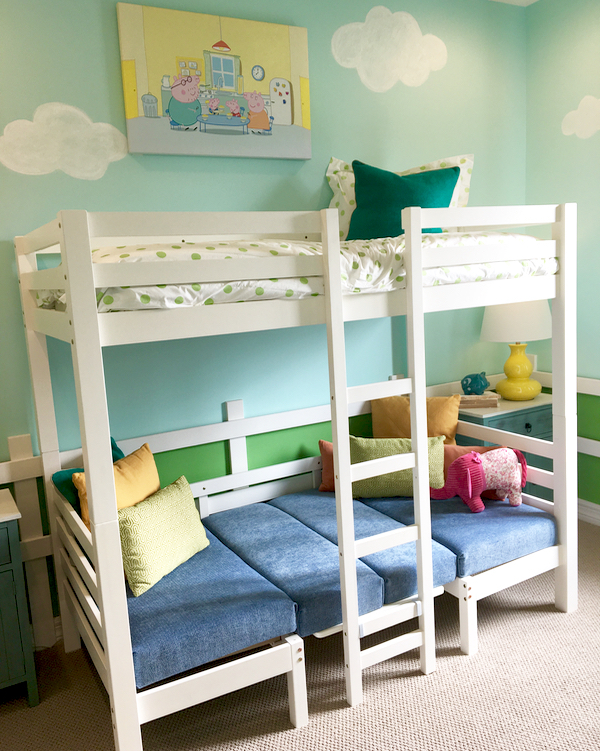 Bunkbeds: It’s true… bunkbeds are one of the easiest ways to efficiently add space to any bedroom. Plus… kids love them! 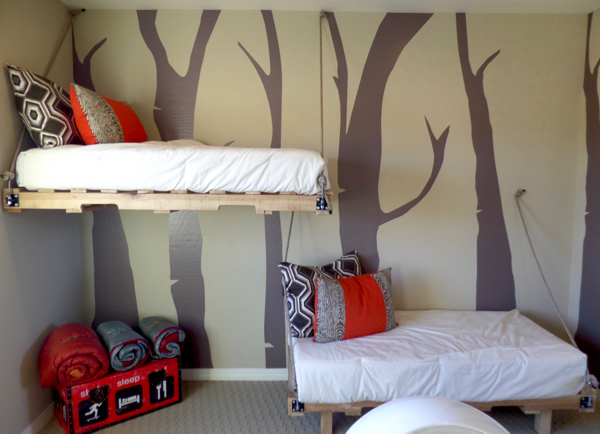 Loft Beds: No need for that extra bunk? 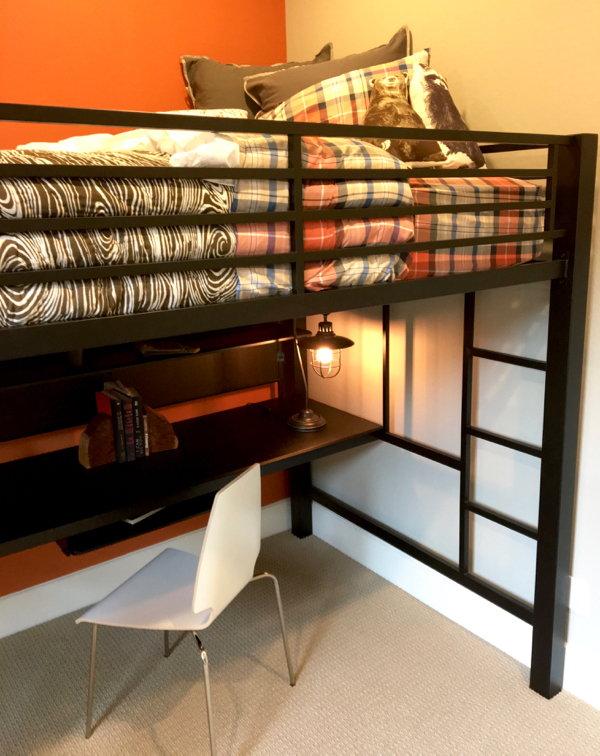 Opt for a loft bed, and use the extra space underneath as a desk/reading area! 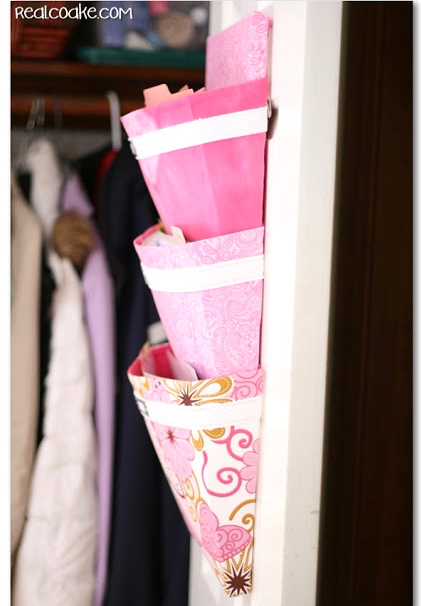 Entryway Organization: Collecting clutter in your entryway? No mudroom? No problem! 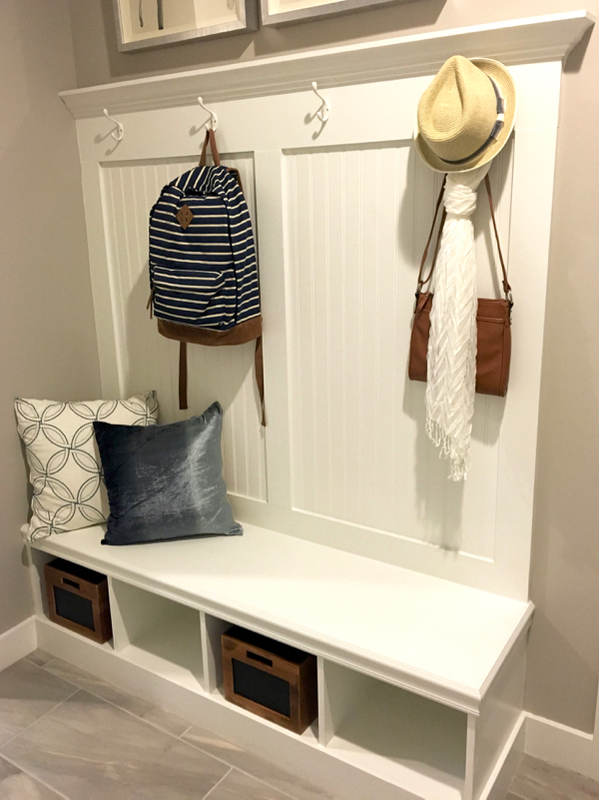 Use an Entryway Storage Bench with Coat Hooks to efficiently contain the clutter and keep your entrance to your home nice and tidy! 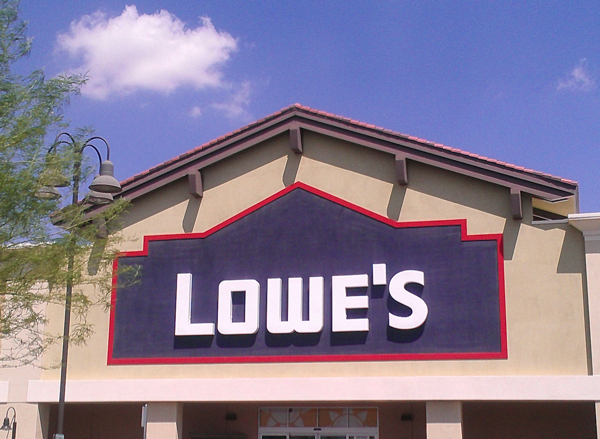 Related: How to Get a Free Lowes Gift Card + 22 Clever Shopping Hacks! Use That Wall Space! I love finding ways to use every square inch of space to double as storage space. Don’t forget the walls! 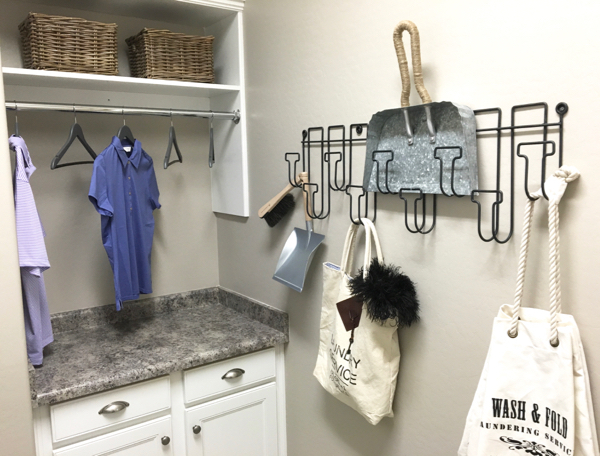 A simple Wire Storage Rack in the laundry room can double as a great catch all for laundry bags, dustpans, feather dusters, and more! Baskets on top of your laundry shelves can add even more storage as well! Don’t forget to keep a Folding Step Stool handy to reach everything you need! 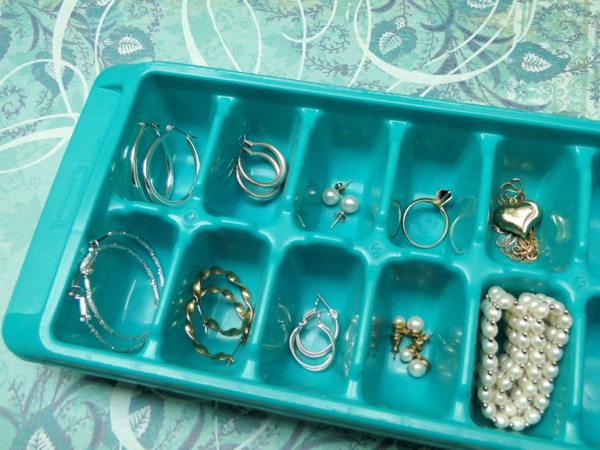 Jewelry Organization: One of my favorite tricks for keeping my earrings and necklaces organized is using an ice cube tray! Weird, right? Each little compartment is the perfect size to hold a ring, pair of earrings, etc! I just keep it in the top drawer of my bathroom, and no more hunting for a matching pair of earrings in the morning! 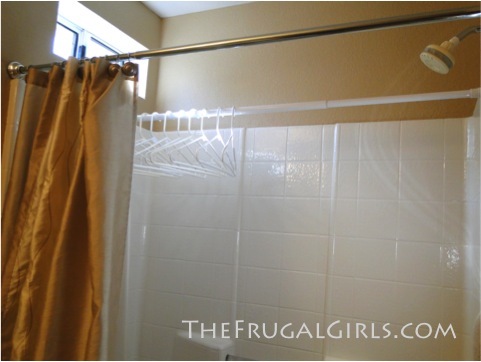 Bathroom Pocket Organizer: An over the door shoe rack with pockets makes the perfect addition to any tiny bathroom. 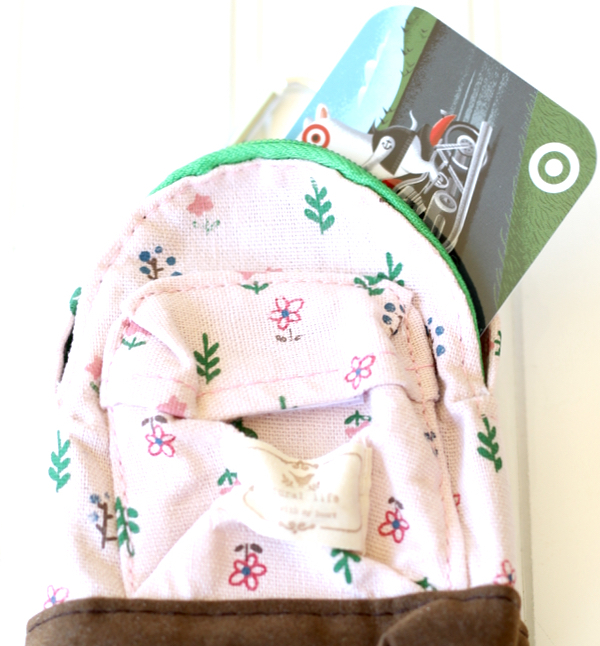 Simply use each pocket to store your bathroom essentials. 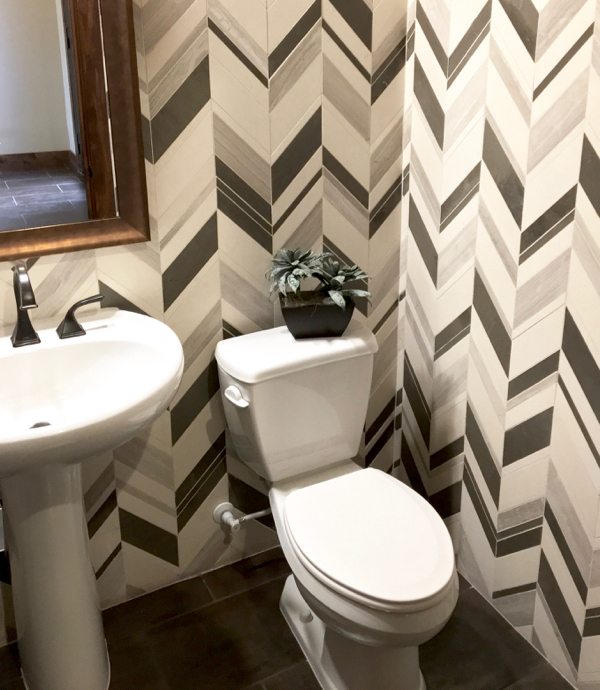 This also works great for small bathrooms with pedestal sinks that lack storage space. 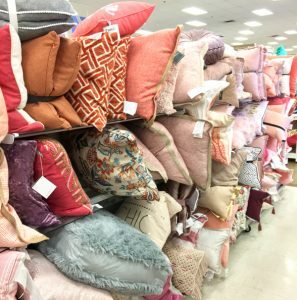 Best Home Decor Tips and Tricks You’ve Never Tried! What are your Creative Storage Solutions or space saving tricks for Tiny Houses and Small Homes? I cut an x in the plastic lid of my plastic coffee can to put plastic grocery bags in. 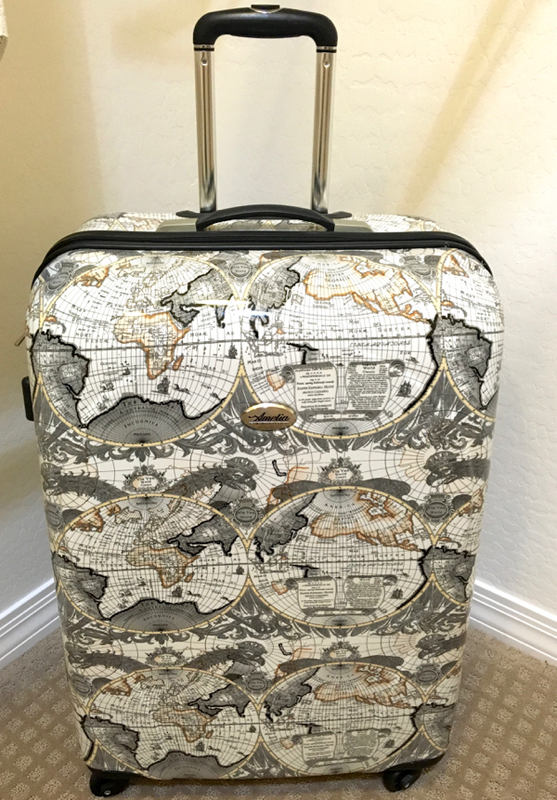 The cool thing is as you push the bags through the x cut in the top, the air is let out of the bag allowing more space for the bags. I then fill each coffee can and then donate the bags to my area charitable resale shop to help them so they do not have to buy bags ,which now gives them extra containers to sort things, and bags to put things in at the store. It s a win ,win and no waste! We must conserve our resources and recycle as much as possible,and the plus is your helping your community in more ways than one! Lovely storage ideas! I just moved to a new place and I’m currently trying to organize the storage space according to my needs. The suggestions you’ve given look very good and seem to fit perfectly to my plans. Thanks for the great ideas! I use a lamp shade for my necklaces. Using a hat pin to hang them, I stick the pin into the top of the shade. You can hang many, many necklaces. Just spin the shade to choose the necklace for the day. 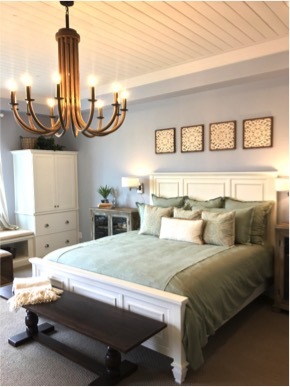 If you have two towel bars, one above the other, on the back of a spare bedroom door, guests have a place to hang their bath towels away from the bathroom. It’s more personal, especially if they’re sharing a family bathroom. Also, replacing the single rods in closets with closet organizers more than doubles the space. I still have a couple of closets that need organizing and this post has reminded me to do just that! 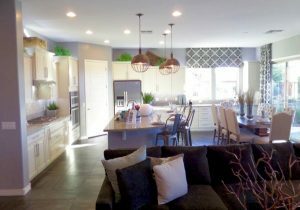 wow such great ideas to be keep ones home so very clean,and orderly..thanks..
We have 950 sq ft, no basement and 6 people. We build a lot of our furniture to suit our spacial limitations. Our entertainment center is wide and tall but shallow. It fits 12 of those 12×12 cubes. We store tons of toys and my yarn in them. Low impact on the floor space but huge organization impact. Bonus, the kids can’t touch our tv. We are in a bachelor sized apartment designed in the late 60’s early 70’s. 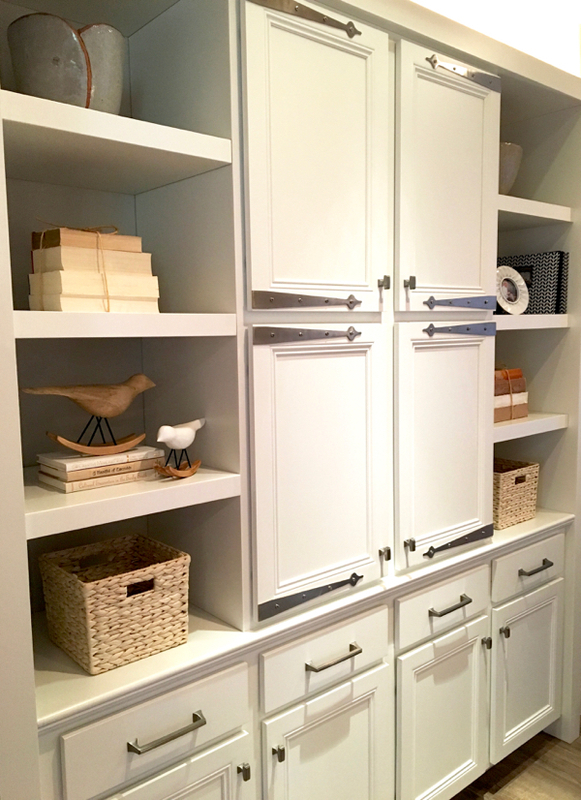 Our linen closet (which has bi-folding doors, so, no extra space there) has to allow for extra pantry items (flour, canned items, pasta, extra box of oatmeal pkgs., etc. ), laundry supplies, sheets, towels. I made my own tool holder from a small cardboard box, poked some holes in it to fit each tool and screwed it to the inside of the kitchen sink cupboard. It holds my multi-head screwdriver, pruners, hammer, pliers, wire cutters and an olfa knife. Winter clothes are in suitcases or in space saver bags which get swapped with each season’s clothes. I am also a quilter, knitter, crocheter so had to be creative with all my hobby supplies too, such as making cardboard shelving unit from Eggo waffle boxes and contact paper for fabric storage. Then there’s the filing bin for quilting projects (an idea I got from You Tube). Oh, I almost forgot to mention all my good crystal, china and other memoirs that are in an off-site storage facility. We have enough stuff to fill a proper house and need to get brutal about down sizing some more. My organizational adventure continues which should go well with all these on-line ideas I continue to find. I have so many spices that I used to keep in a cabinet but hardly could see all of them. 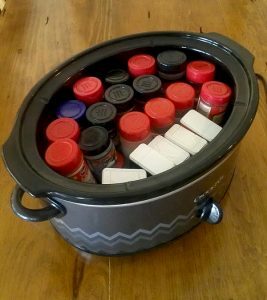 So now I put them in a kitchen drawer laying down with label face up in a row was able to make 3 rows using the glass containers and a row of smaller plastic spice containers. I put them in alphabetical order. Now able to see all my spices. We bought a dresser at a resale shop and we are using it as a tv stand. We took the top row of drawers out to have a shelf for the cable box and DVD player. The rest of the drawers are used to for storing DVDs, games, and a few extra blankets. I use a spice rack for my nail polish, small bottles of perfume, creams,etc in my bathroom, taking little space all looks neat and orderly.. I have another to share. Take a French Memo Board, the fabric covered memo board with ribbons all criss crossed on it. 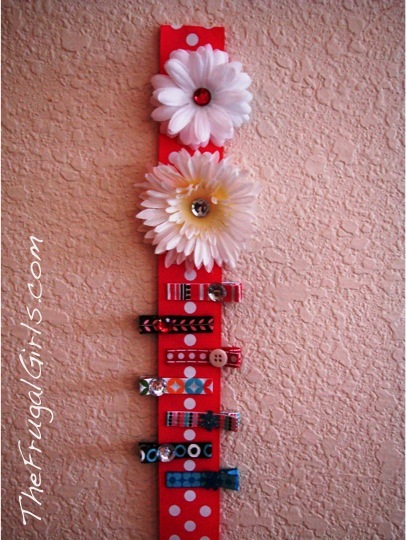 Get decorative pins and stick up necklaces or hang dangly earrings off the ribbon. It’s pretty and organizes. Makes jewelry easy to find in a hurry. I have many lotion and shower gel fragrances and love using them. To keep them in sight, I use a decorative antique cake plate (the pedestal kind). It sits on my bathroom counter without hogging counter space. At our $ store they sell what looks like a glass plate ( size of a dinner plate) it is a lazy susan, it can be spun around for whatever you need., it looks attractive being clear, sits close to the counter,. it has little suction cups on the bottom so when you spin it it doesnt move but easy to re-positioned. .what a deal at $2..
We are a family of 6. Our home is the place where 4 of us do school full time, 2 of us run businesses, and all of us entertain! One of the best tips I was given is to budget my space. For example, I have 3 bins in the attic for Christmas stuff. No matter how much Christmas paraphernalia we get over the years it must fit in those 3 bins. If something gets added, something else has to go. I do that with all of my clothes, books, utensils, dishes, you name it. If something seems crowded or overflowing I either have to reorganize it, pitch it or both. 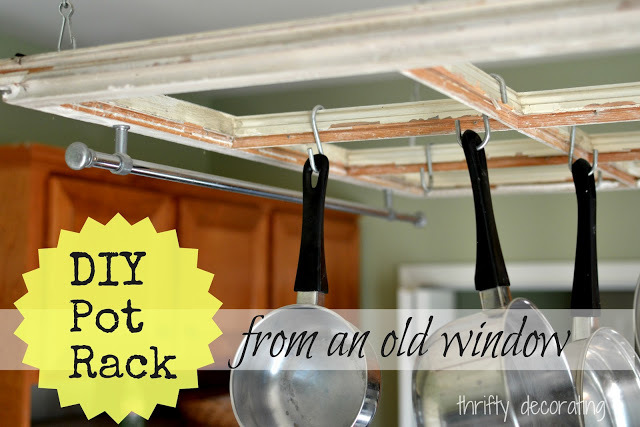 I hang all my necklaces on a man’s tie rack, the kind meant to hang on a closet rod. I hang the tie rack on a hook on an inside closet wall next to the closet door, where it doesn’t interfere with the hanging clothes. When I want a necklace, i just reach in, take down the “necklace rack”, hang it on a clothes hook (on the inside of my closet door where I also hang PJs, recently removed clothing) and can choose what I want–then put it back. No more tangled chains or forgotten/unseen jewelry! The same idea works for scarves and circle bracelets, using belt holders instead of tie rack. Me too, but I use the wall mount kind that are an accessory for wire closet shelving systems. I group the necklaces by color! Great system, easy to grab exactly what I want.